In nuclear medicine, technologists use radionuclides—unstable atoms that emit radiation spontaneously— to diagnose and treat disease. Radionuclides are purified and compounded to form radiopharmaceuticals. Nuclear medicine technologists perform quality assurance on equipment and administer radiopharmaceuticals to patients and then monitor the characteristics and functions of tissues or organs in which the radioactive drugs have localized. Abnormal areas show higher-than-expected or lower-than-expected concentrations of radioactivity. Nuclear medicine differs from other diagnostic imaging technologies because it determines the presence of disease on the basis of cellular metabolic changes rather than changes in organ structure or anatomy. Nuclear medicine technologists operate scintilation "gamma" cameras that detect and map the radioactive drug in a patient’s body to create vivid diagnostic images. After explaining the test procedures to patients, technologists prepare a dosage of the radiopharmaceutical and administer it by mouth, injection, inhalation, or other means. 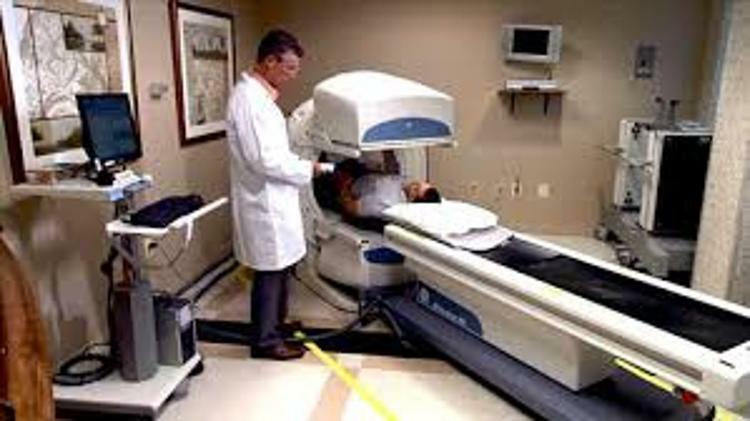 The technologist would next position patients under the gamma camera, or “scanner,” which creates images of the distribution of a radiopharmaceutical as it localizes in, and emits photons from, the patient’s body. The technologist processes and manipulates the images on a computer and when completed are printed or sent electronically via a PACS system to the physician to interpret. When preparing radiopharmaceuticals, technologists adhere to safety standards that keep the radiation exposure as low as possible to workers and patients. Technologists keep patient records and document the amount and type of radionuclides that they receive, use, and discard. Physical stamina is important because nuclear medicine technologists are on their feet much of the day and may have to lift or turn disabled patients. In addition, technologists must operate complicated equipment that requires mechanical ability and manual dexterity. Although the potential for radiation exposure exists in this field, it is minimized by the use of shielded syringes, gloves, and other protective devices and by adherence to strict radiation safety guidelines. The amount of radiation in a nuclear medicine procedure is comparable to that received during a diagnostic x-ray procedure. Technologists also wear badges that measure radiation levels. Because of safety programs, badge measurements rarely exceed established safety levels. Nuclear medicine technologists generally work a 40-hour week, perhaps including evening or weekend hours, in departments that operate on an extended schedule. Opportunities for part-time and shift work also are available. In addition, technologists in hospitals may have on-call duty on a rotational basis, and those employed by mobile imaging services may be required to travel to several locations.